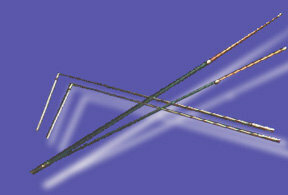 Dowsing rod: stick used in searching for underground water, minerals, berried treasure, lost things, etc. It has been used for centuries in many parts of the world. The instrument is typically a forked twig. What is dowsing? It is an ancient art of searching for hidden things (water, treasure, lost thing, etc). Almost everyone is able to use this special sense, and use the body as a transmitter of the specific wave pattern, which has been sent by: water, lost thing etc. radiation of underground streams, rivers, etc) There is plenty of information on the internet on the subject. The simple bober is a common one handed rod. Very popular with both experts and novices, this rod "bobs" up/down, left/right, or in circle to indicate the results of questions. Simplest rod to use and easiest to read. Also shows the direction of the flow of underground water streams as well as where they branch off or cross other streams. One of the most sensitive dowsing instruments known. Great for map dowsing, energy measurement (ex. Auras), or any other kind of dowsing. Biotensor rod is a smaller, easier to operate however less sensitive version of Aurometer. The oldest type of dowsing rods. The shape came from the branch of the tree traditionally held by a dowser while searching for water or other underground resources.